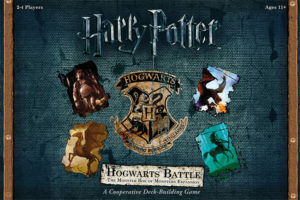 We review the Monster Box of Monsters expansion to the deck building game Harry Potter: Hogwarts Battle. This new expansion adds a variety of elements that really ratchet up the difficulty of the base game. At Gen Con 2016, publisher USAopoly created a ton of buzz with their new deck building game Harry Potter: Hogwarts Battle. If you haven’t heard much about this accessible deck building game, you can read our full review on the core game here. This year, publisher USAopoly has designed more content for the game in the form of the Monster Box of Monsters expansion. Players will now face the denizens of the Forbidden Forest as they seek to once again do battle against He Who Must Not Be Named. 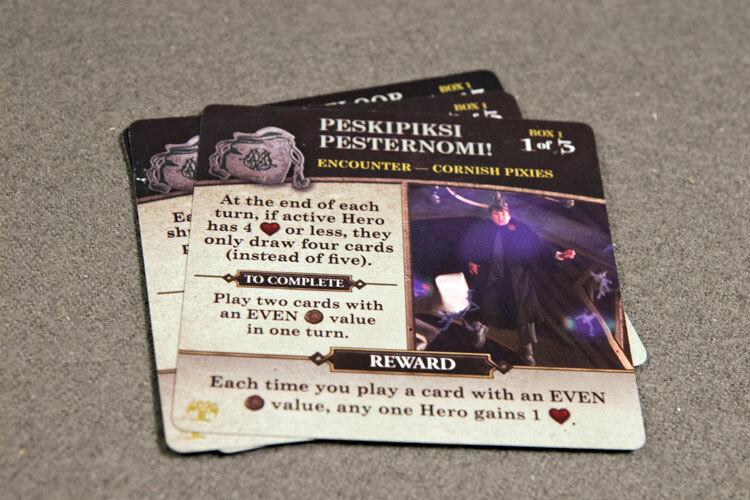 Encounter cards replace the Horcruxes from Game 7. 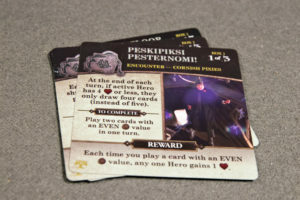 Replacing the Horcruxes from game 7 are encounter cards. These function similar to the horcrux cards, and provide challenges for the players to overcome. Each Encounter card will grant a reward to the player that overcomes it. These encounters (3 per game) must also be defeated before players can win the game. In addition to new villains, the game also comes with creature cards. These function similar to villain cards, however some of the creatures must be defeated with influence rather than attack. The influence spent is also limited to only one per turn. 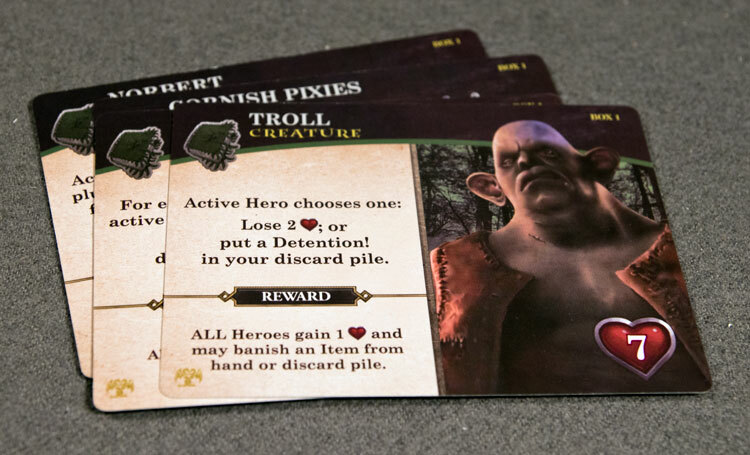 As a way to ratchet up the difficulty, the expansion includes a stack of detention cards. These will feel familiar to someone who’s ever played another deck builder as they simple serve to clog up your hand. Many of the expansion’s new dark art, encounter, and villain cards will utilize these. Finally there are a pile of new dark arts cards, Hogwarts cards, and other various tokens that will be added throughout the 4 games of the expansion. 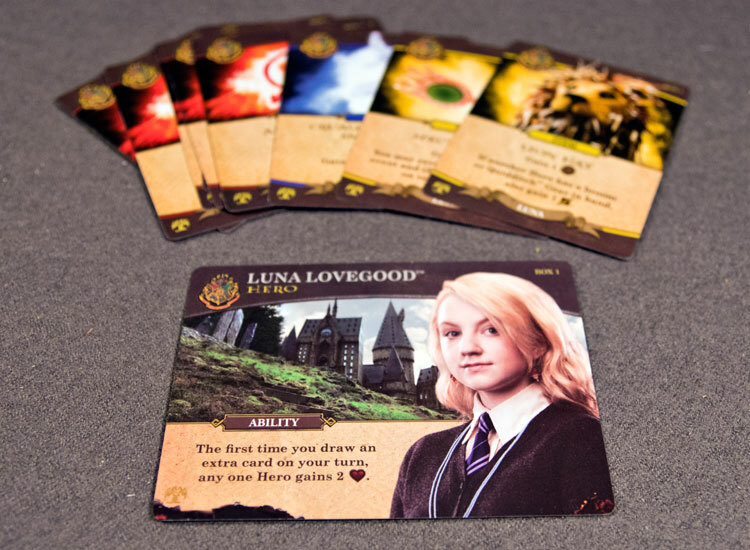 Luna Lovegood is now a playable character. 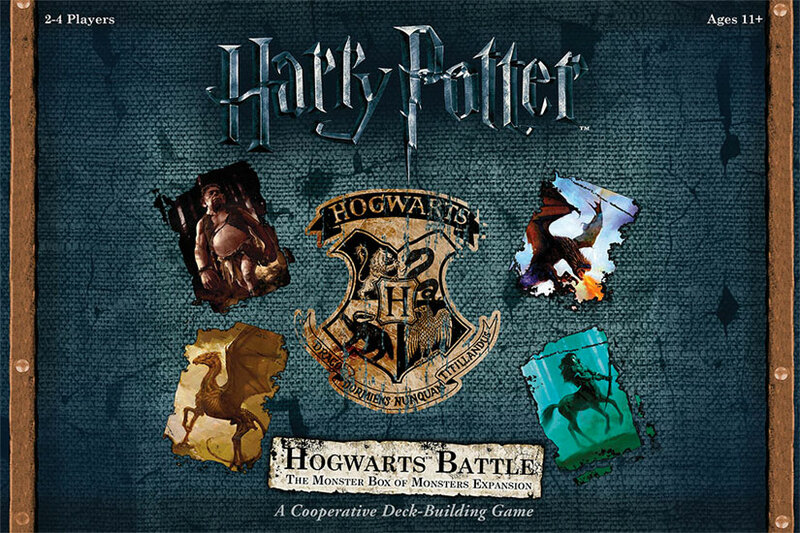 One criticism of the base game of Hogwarts Battle was that the game could feel too easy at times. This was especially true after you’ve gotten a number of games under your belt and had a solid strategy. Yet as Hogwarts Battle always felt like a gateway game, I never had a problem with this. The Monsters Box of Monsters apparently took that criticism to heart as the game is significantly more difficulty now. So much so that once you add in the expansion, I’d call it more of a gamer game than a gateway game. You need to some serious strategy (and luck) if you are going to win, especially in the later games. Detention cards server only to clog up your hand. One reason is the detention cards. There are a number of cards that add these to your hand, and drawing even a couple of them into your hand will basically waste your turn. Thankfully, the game does now provide a way to cull cards from your deck now (something glaringly missing from the base game), but if those don’t happen to show up in the market, you are going to be in a world of hurt. I did appreciate USAopoly adding another playable character to the mix, and I really like Luna’s power. Once you get into the later boxes, she gets really good at getting cards into player’s hands. The downside though is that there are many cards that basically take her power away (stopping players from drawing cards). So while she is great at times, playing her can also be quite frustrating. One area that the expansion didn’t address that I really wish it would have is with the setup. I really wish that the expansion would have introduced either tiered villains or more powerful starter decks. There are specific villains that, if they come out at the start, you are basically screwed unless you get supremely lucky. It’s doubly so if you get more than one of those. And as some of the location cards in the expansion are quick to flip, and you may as well forfeit if your opening draw has Bellatrix and Fenrir. That being said, I did enjoy the addition of the creature cards. 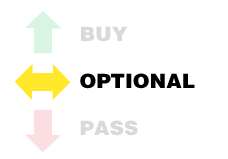 If you get a turn where you only earned 2 influence and there was nothing in the market you can buy, it’s nice having an extra use for those coins. I even thematically liked how you are using your influence to deal with the less evil creatures instead of bashing them with your spells. Players now have to fight the creatures of the Forbidden Forest. For those of you that were enjoying your battles in the Potterverse, but wanting more of a challenge, you’ve found it. The Monster Box of Monsters not only adds a good amount of variety to the game, but definitely cranks up the difficulty. The down side is that it further exposes the flaws of the base game. The larger pool of cards can really have the setup draws make or break the game for you. 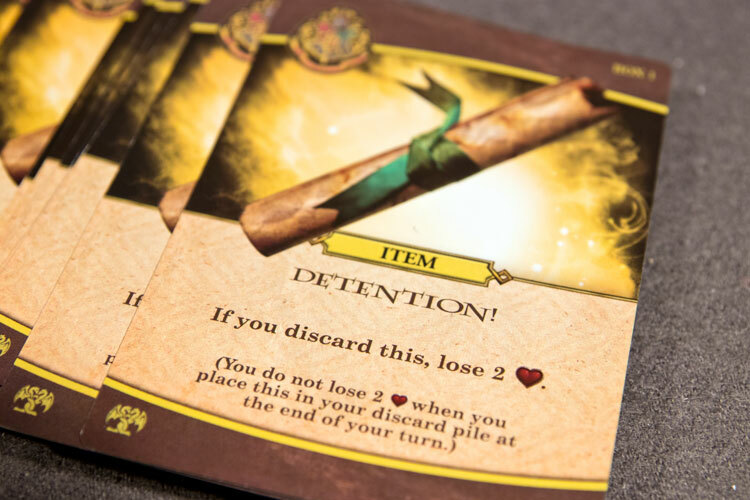 And for a game that was already feeling too long by game 7, the detention cards can really draw out the game if you happen to be flooded with them. One of our games took 2 hours because we were constantly in detention. That’s just too long for this game. So in the end, I don’t think the Monsters Box of Monsters will be for everyone. If you enjoyed the accessible/gateway nature of Hogwarts Battle, you are probably going to want to give this one a pass. However if you thought the game was too easy and you are looking for more of a challenge, you’ve definitely found it.